Glendon Wasey (Sean Penn) is a sleazy, down-on-his-luck con man struggling to sell glow-in-the-dark neckties in Shanghai. 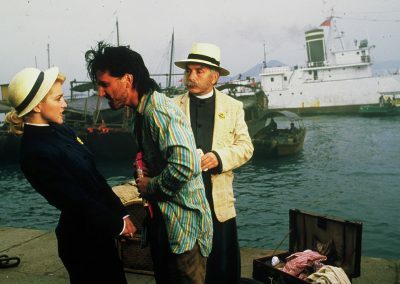 When he encounters the lovely Gloria Tatlock (Madonna), a missionary nurse who wants to obtain a supply of opium to ease the suffering of her patients, he decides to help her get hold of a stolen supply of the valuable drug. The only problem is that a lot of other people want to secure the stolen opium as well—gangsters, smugglers, thugs and a host of dangerous lowlifes.